HighEdWeb is a conference for all higher education Web professionals — from programmers to marketers to designers to all team members in-between -- who want to explore the unique Web issues facing colleges and universities. 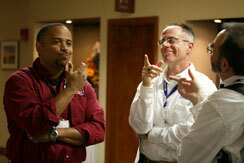 Attendance grows each year — more than 400 higher ed Web professionals attended HighEdWeb in 2008. Yes. You can submit your presentation proposal online. All proposals regarding the Web and higher education are welcome. To learn more, visit the Call for Proposals page. Online registration will open May 1, 2009, and continue until August 29, 2009, or until the conference registration is full. Register early to get the early-bird discount pricing. Also, presenters receive a discount on their registration fees so be sure to send in a presentation proposal. For an additional fee, extended pre- and post-conference workshops are also available. Check our website 2009.highedweb.org, as well as join the conference Ning community, read our blog, and follow us on Twitter (@HighEdWeb). Where will the 2009 conference be held? HighEdWeb 2009 will be held October 4-7 at the Hilton Milwaukee City Center in Milwaukee, Wisconsin. Milwaukee is just 80 miles north of Chicago, on the shore of Lake Michigan in southeastern Wisconsin. With over 600,000 residents, Milwaukee provides the resources of a large city with the feel of a small, friendly community. For more information, visit our page regarding Venue and Travel. The conference hotel is the Hilton Milwaukee City Center, where rooms can currently be booked at the special conference rate of $129/night. Ranked by Conde Nast Traveler readers as one of the top five airports for business travelers three years in a row, Milwaukee's General Mitchell International Airport offers non-stop jet service to over 40 cities and connections worldwide through several airlines. By car Milwaukee is conveniently located off of Interstates 94 and 43 and is within a day's drive to over one-third of the United States. For more information, visit our page regarding Venue and Travel.